While providing an essential service and convenience for our home, the electrical panel is not the most attractive piece of décor within the house. They are usually located in utility rooms, garages, basements, or outside the home, but sometimes they are in a room that could be multi-purpose, and cleaning up the looks of the room may include finishing the walls up to a flush-mount panel, or putting a cabinet around a surface mounted panel. In either case, doing so can bring about some issues of access to the electrical equipment. Also, there are times when a remodeling project includes the moving or elimination of electrical outlets. If abandoning an outlet or outlets, how do you do so keeping compliant with the electrical code? I have had a couple of questions regarding the accessibility of electrical equipment or components like outlet or junction boxes, transformers, and other electrical devices. I am building my home and I notice that the transformer for the doorbell is attached to the circuit panel outside of the box. I find this awkward since when I will install my dry wall, I will not be able to access the transformer without destroying my dry wall. I am going to add an electrical box (a switch box) which I will connect to the main circuit box and I will then be able to insert my transformer in that switch box, this way, if ever that transformer become defective, I will be able to replace it without destroying my dry wall. My question/comment is why do they install that transformer this way? I am remodeling, and would like to eliminate my outdoor lights on either side of my patio doors. I know you are not allowed to cover a junction box by code. What do I do? As per the code book, and for reasons that just make sense, you must leave access for future replacement, inspection, and troubleshooting activities in an electrical system. First let’s deal with the first question and proposed solution regarding the doorbell transformer at the panel. The solution proposed is a good one, but there are other options. The reason the transformer is installed at the panel is simply for convenience, and to save installation time and cost. 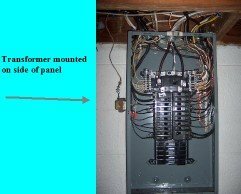 If the electrical panel is to remain in a room that isn’t finished off with wallboard, drywall, or paneling of some kind, then this is a reasonable place to install the transformer. However when the time comes to finish off the interior walls around where the panel is located, then the transformer would no longer be accessible. Kudos to this person for recognizing the problem, and taking steps to rectify the situation. The problem now is where to mount this new surface-mount box that isn’t going to be obtrusive and unattractive, with a transformer hanging off the side of it? There is another solution that works well. 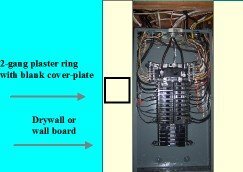 Before finishing the walls up to the electrical panel, install a 2-gang plaster ring, or low voltage outlet box (the kind that have no back on them, or are just an access ring), beside the panel just in front of the location of the transformer, and then finish it off with a 2-gang blank cover plate. A 2-gang opening is large enough to get your hand inside the wall and for the extraction of the transformer should it ever need to be replaced. A small label should be attached to the plate to indicate that it is for bell transformer access. In fact this is a good idea when finishing a wall right up to a flush-mounted panel as this also serves as an access point if future circuits are added to the system. If you ever want to abandon junction boxes, as in the second question above, this is okay, providing that you disconnect the wires that go to these boxes at the source location of the power for them, i.e. the switch box. Remove the wires that go to this location or locations by taking them right out of the splice or off of the switch terminal(s) and tape or cap them off with a wire nut. Cap off the hot wire and neutral wire as well. Then attach a piece of white electrical tape, or duct tape to the abandoned wires with a notation written in permanent felt pen that the cable has been abandoned in the walls and are no longer in service. If you are sure that they will never be needed again you could even loosen the cable clamp in the switch box and push the unused cable back into the wall space. The switch box containing the live wires will have to be covered with a blank cover plate. This solution will only work provided that the abandoned outlets for the lights that you removed do not feed power to any other outlets in the circuit that you wish to keep in use. If this happens to be the case, then you cannot cover the junction box and you need to use a cover plate. There are decorative cover plates available, or you could paint a plain metal cover plate to match the décor or to blend it into the wall finish making it less visible or obtrusive. So the long answer is above, and the short answer is that you can never cover the access to any electrical equipment, junction, or outlet boxes. However with a little creativity, options do exist. And as always – safety first! If you’re not comfortable tackling these types of home wiring projects yourself click here to contact qualified electricians in your area. 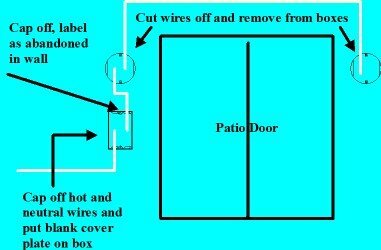 This entry was posted in Electrical Wiring and tagged cable, cable clamp, circuit panel, circuits, cover, electrical, electrical equipment, electrical outlet, electrical panel, hot wire, junction box, junction boxes, low voltage outlet box, neutral wire, outlet, outlet box, outlets, panel cover, plate cover, switch box, switch terminals, transformer, wire, wiring. Bookmark the permalink.